Dear Dr. Baldwin & all the girls! I just wanted to write you and tell you a long overdue thank you for everything you all did for me last year. It has been a life changing experience to say the least! If you ever need anything or if I can do anything for you, please let me know! 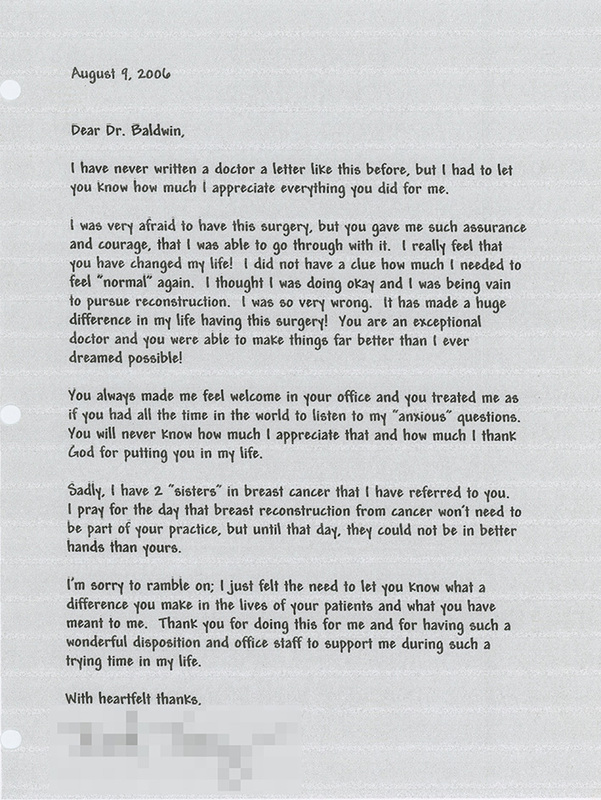 I have never written a doctor a letter like this before, but I had to let you know how much I appreciate everything you did for me. I was very afraid to have this surgery, but you gave me such assurance and courage, that I was able to go through with it. I really feel that you have changed my life! I did not have a clue how much I needed to feel “normal” again. I thought I was doing okay and I was being vain to pursue reconstruction. I was so very wrong. It has made a huge difference in my life having this surgery! You are an exceptional doctor and you were able to make things far better than I ever dreamed possible! You always made me feel welcome in your office and you treated me as if you had all the time in the world to listen to my “anxious” questions. You will never know how much I appreciate that and how much I thank God for putting you in my life. 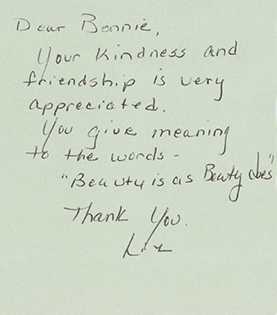 Sadly, I have 2 “sisters” in breast cancer that I have referred to you. I pray for the day that breast reconstruction from cancer won’t need to be part of your practice, but until that day, they could not be in better hands than yours. I’m sorry to ramble on; I just felt the need to let you know what a difference you make in the lives of your patients and what you have meant to me. Thank you for doing this for me and for having such a wonderful disposition and office staff to support me during such a trying time in my life. Thank you so much for the gorgeous flowers that you sent me. 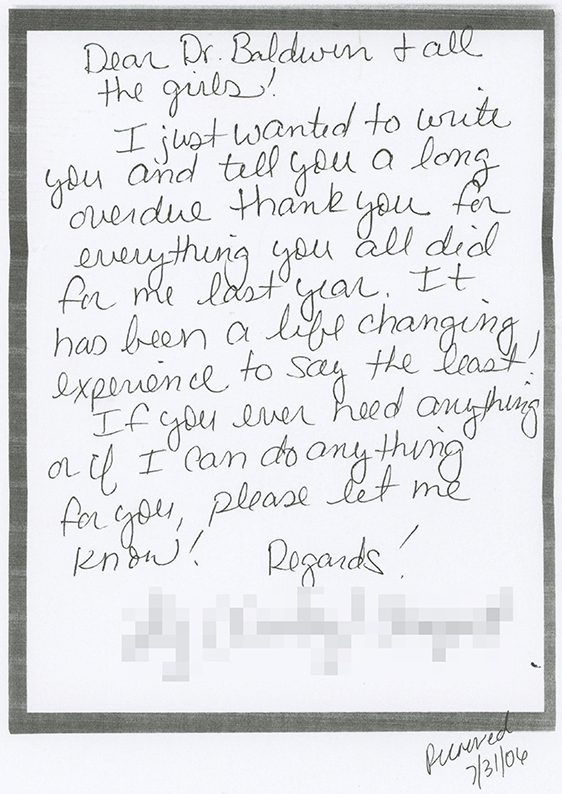 It meant so much to me to receive them while I was beginning the recovery process. All 3 of you have been worderful throughout my entire time with you and have always made me feel 100% comfortable and know that I made the right best decision coming to you for my procedure. Thank you again for everything! P.S. – I promise to send a pic from Australia once I get there in January! 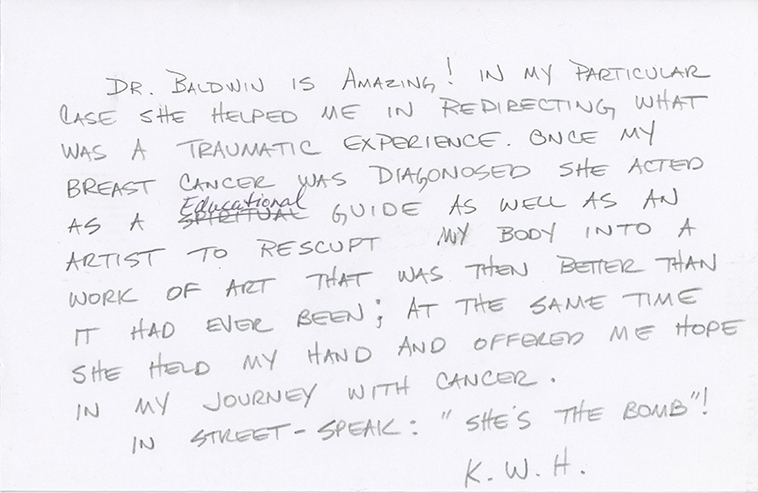 Dr. Baldwin is Amazing! In my particular case she helped me in redirecting what was a traumatic experience. Once my Breast Cancer was diagnosed, she acted as an educational guide as well as an artist to resculpt my body into a work of art that was then better than it had ever been; at the same time she held my hand and offered me hope in my journey with cancer. In street-speak: “She’s the bomb”!